And that debut could happen as early as this September. We already knew BMW will be shifting gears, so to speak, regarding its EV strategy. Instead of a sub-brand, as is currently the case with the i3 and i8, BMW will launch all-electric variants of existing models. According to a report from German publication Handelsblatt and first picked up by Bimmer Post, an all-electric 3 Series is said to debut this September at the Frankfurt Auto Show. BMW wouldn’t debut such an important model if it wasn’t capable of taking on the also upcoming Tesla Model 3, which will be its main competitor. We’re told the 3 Series EV will have a range of at least 250 miles. The base trim Model 3 can go at least 215 miles before requiring a recharge. The i3 can be had as a pure EV, but it’s still not considered to be a so-called mainstream model. 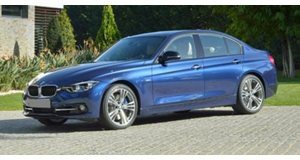 The new 3 Series EV will change that perception. At the same time, BMW is also working on an all-electric version of its just revealed X3 crossover as well as a Mini model, both of which are expected to arrive sometime in 2019. BMW is also hard at work developing the next generation 3 Series, which, assuming this latest rumor is true, will undoubtedly offer a pure EV variant.